Formerly known as the Old Birmingham Hotel, the building was constructed by Thomas B. Newton, Jr. around 1865. It originally stood next to Hickory Flat Road, but was relocated here in 2007 to preserve it. 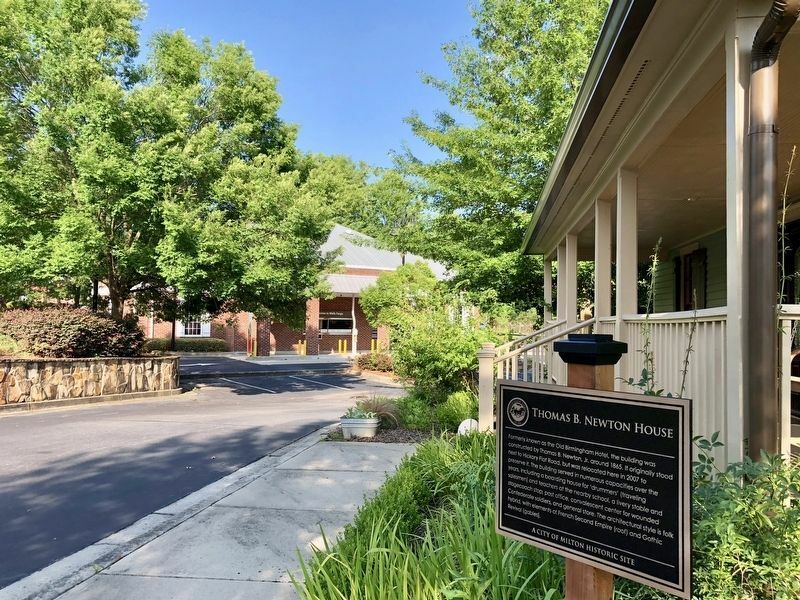 The building served in numerous capacities over the years, including a boarding house for 'drummers' (traveling salesmen) and teachers at the nearby school, a livery stable and stagecoach stop, post office, convalescent center for wounded Confederate soldiers, and general store. 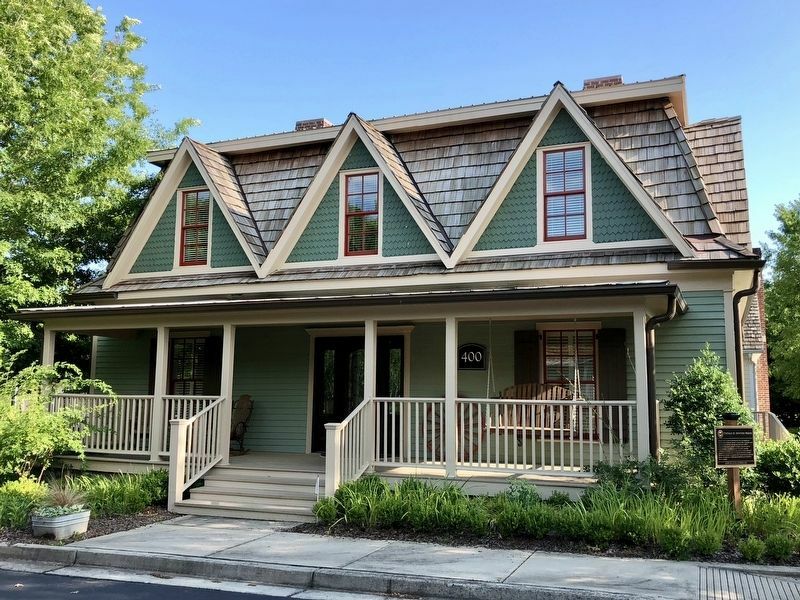 The architectural style is folk hybrid, with elements of French Second Empire (roof) and Gothic Revival (gables). Location. 34° 9.977′ N, 84° 20.052′ W. Marker is in Milton, Georgia, in Fulton County. Marker can be reached from the intersection of Birmingham Highway and Hickory Flat Road. Touch for map. House is building 400. Marker is at or near this postal address: 15800 Birmingham Highway, Alpharetta GA 30004, United States of America. Touch for directions. (approx. 0.6 miles away); Double Branch Voting District Courthouse (approx. 0.9 miles away); Phillips Homestead (approx. 2.6 miles away); Thomas Byrd House (approx. 2.7 miles away); Hopewell Baptist Church (approx. 2.9 miles away); Willis Cass Tucker, Jr Home (approx. 2.9 miles away); Summit School (approx. 3 miles away). Touch for a list and map of all markers in Milton. 3. View from marker looking east towards the corner bank. More. 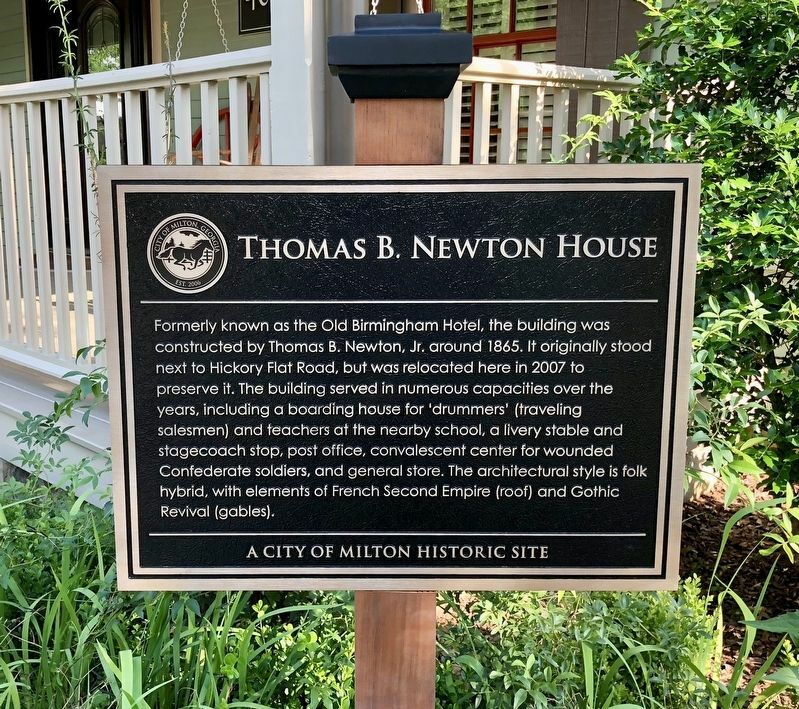 Search the internet for Thomas B. Newton House. Credits. This page was last revised on June 3, 2018. This page originally submitted on June 3, 2018, by Mark Hilton of Montgomery, Alabama. This page has been viewed 68 times since then and 7 times this year. Photos: 1, 2, 3. submitted on June 3, 2018, by Mark Hilton of Montgomery, Alabama.